Thornhill Trojans will aim to defend the Heavy Woollen ARL Jim Brown Cup as they have received a bye to the semi-final stage of this season’s competition. The Trojans, who defeated Shaw Cross Sharks in last season’s final at Batley’s Mount Pleasant, will face Dewsbury Celtic in the semi-final. Batley Boys face Shaw Cross Sharks in the preliminary round, with the winners taking on Dewsbury Moor in the semi-finals. Thornhill won both open age competitions last season, with their A team lifting the John Kane Cup with victory over Ossett Trinity. Thornhill A begin their John Kane defence against Birstall Victoria, with the winners meeting Batley Boys DMR (A team) in the semi-final. Dewsbury Celtic A face Shaw Cross A in the other John Kane preliminary round tie, with the winners taking on Dewsbury Moor A in the last four. The Heavy Woollen ARL Ernest Wilby Under-18s Cup semi-finals see Batley Boys taking on Dewsbury Celtic and Shaw Cross facing Dewsbury Moor. Birstall Victoria host Shaw Cross and Batley Boys entertain Dewsbury Celtic in the Under-16s Douglas Hird Cup semi-finals. The Under-15s Malcolm Waring Cup semi-finals see Thornhill hosting Dewsbury Celtic and Batley Boys taking on Shaw Cross. Shaw Cross Sharks will run two teams at Under-14s level this season and they face each other in the Heavy Woollen Reporter Cup semi-final, with Batley Boys taking on Dewsbury Moor in the other semi. There are two preliminary rounds scheduled in the Under-13s James Flannigan Cup with Batley Boys facing Thornhill Trojans Warriors and Dewsbury Moor meeting Shaw Cross Sharks. Birstall Victoria meet the winners of Batley Boys and Trojans Warriors in the semi-final. Thornhill Trojans will visit the winners of Dewsbury Moor and Shaw Cross in the other semi. Thornhill Trojans face the Trojans Warriors in the Under-12s Gary Talbot Cup preliminary round, with the winners facing Dewsbury Moor in the semi-finals. Dewsbury Celtic take on Shaw Cross Sharks in the other semi-final. Dates and kick off times for all the Heavy Woollen cup competitions will be announced when ties have been arranged. Preliminary round: Batley Boys v Shaw Cross. Semi-finals: Dewsbury Celtic v Thornhill Trojans, Dewsbury Moor v Preliminary Round Winners. Preliminary Round A: Birstall Victoria v Thornhill Trojans A. 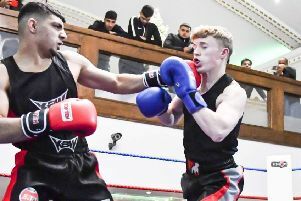 Preliminary Round B: Dewsbury Celtic A v Shaw Cross A.
Semi-finals: Batley Boys A v Winners Game A, Winners Game B v Dewsbury Moor A.
Under-18s Semi-finals: Batley Boys v Dewsbury Celtic, Shaw Cross v Dewsbury Moor. Under-16s Semi-finals: Birstall Victoria v Shaw Cross, Batley Boys v Dewsbury Celtic. Under-15s Semi-finals: Thornhill Trojans v Dewsbury Celtic, Batley Boys v Shaw Cross. Under-14s Semi-final: Shaw Cross 2 v Shaw Cross 1, Batley Boys v Dewsbury Moor. Under-13s Preliminary Round A: Batley Boys v Thornhill Trojans Warriors. Preliminary Round B: Dewsbury Moor v Shaw Cross. Semi-finals: Birstall Victoria v Winner Game A, Winner Game B v Thornhill Trojans. Under-12s Preliminary Round: Thornhill Trojans v Thornhill Trojans Warriors. Semi-finals: Dewsbury Celtic v Shaw Cross, Dewsbury Moor v Winner of Preliminary Round.